But sometimes you don’t want to put something in the oven for an hour… You don’t want to put it on in your overheated apartment (I’ve been there!) or it’s already full of something else, or – probably the most common – you just want something that will be ready to eat soon after you get home. 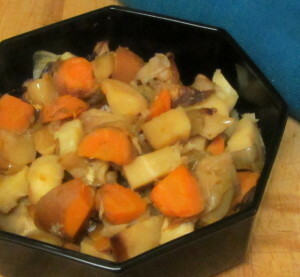 So then – cook your root vegetables in a slow cooker! The basic recipe here is for one and a half pounds of mixed root vegetables, with one large (or two medium) onions, mostly because that’s what I happened to have on hand… and I just used carrots and parsnips because (sing it with me) that’s what I had… But measurements are far from precise, you could easily double it in my five quart slow cooker, or triple it in a larger one, and it would be well worth it, because it reheats beautifully. 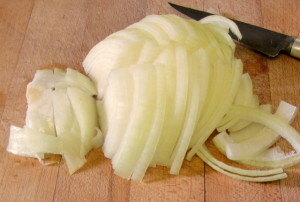 Peel the onion… and slice it fairly thin. Then strew half the onion on the bottom of the slow cooker… as it cooks, it will give up moisture, and that will help start the cooking. Anyhow – scrub the roots and if necessary peel them. Obviously you’ll peel rutabaga… I usually don’t peel carrots, but they need serious scrubbing, and I will peel if they are too gnarly and hard to clean, or if the skin looks tough. And so on, depending on the vegetable. Cut the vegetables into small chunks. Put that in the slow cooker on top of the onion. Then add the rest of the onion over the roots. Sprinkle a pinch of salt over all. I added several peeled cloves of garlic – just dropped them into the mixture. They cook to a delicate, soft and sweet flavor, and add a note to the rest. Use as much or as little as you like. I did not add any liquid. You might want to add a splash of water if the onions are older and dry. 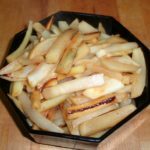 That would also be another way to vary the flavor – a tablespoon or two of balsamic vinegar, or broth, or soy sauce… Don’t use more than two tablespoons, though – this is not a braise, and the vegetables themselves have enough moisture to cook. I cooked these on high for five hours. Low for seven or eight would be fine as well… Longer would also work, though the vegetables would soften even more. This amount gave us enough for several meals. We ate it plain that night. I mixed it with broth and some cooked chicken to make a delicious and very easy soup for lunch the next day. The rest is in the refrigerator… and will probably just be reheated. 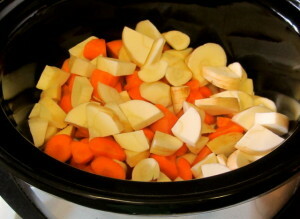 "Bake" root vegetables in a slow cooker - set it up in the morning, and make enough for several meals. 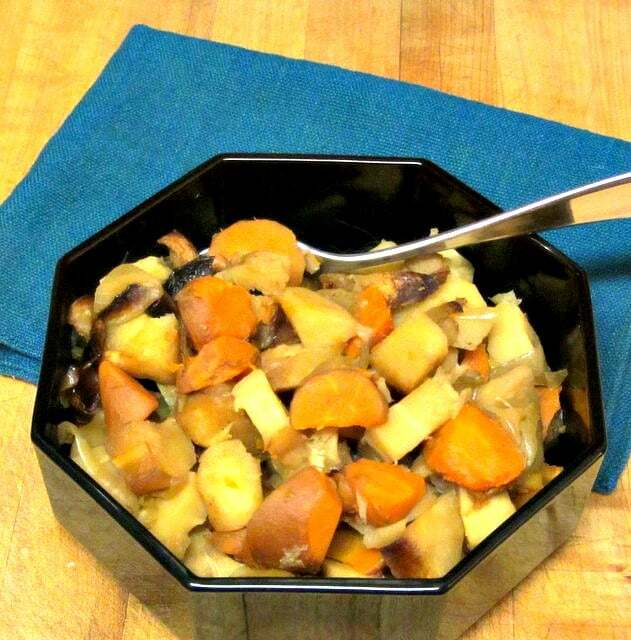 An easy and delicious winter vegetable recipe. Peel the onion, quarter it, and slice it fairly thin. 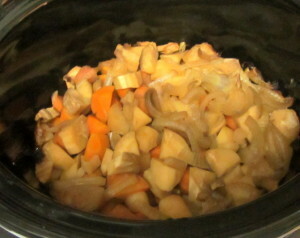 Strew half of it in the bottom of a slow cooker. Prepare other vegetables - scrub, peel if needed, and chop in bite sized pieces. Add them to the slow cooker. Distribute the rest of the onion over the top. Add the peeled garlic. Sprinkle salt lightly over the vegetables. Cook on High heat for five hours. 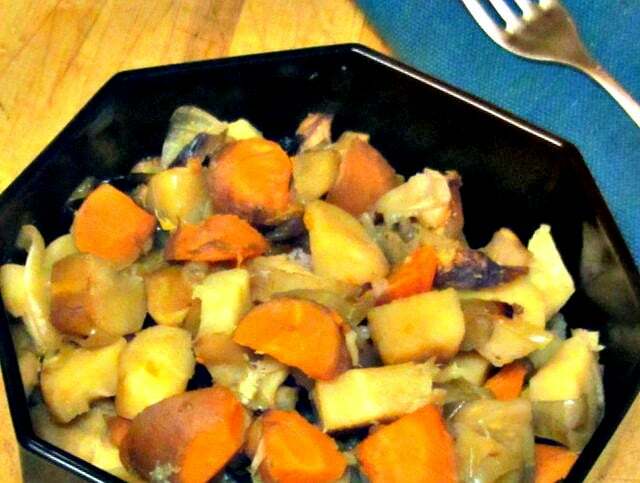 I love root vegetables but I have never tried cooking them in a slow cooker.....great idea! I love finding new things to slow cook because they are so convenient. This looks very healthy too! I like this idea! I hate leaving my oven on for an hour at such high heat, especially on hot days! This sounds delicious! I love a slow cooker on a hot day! 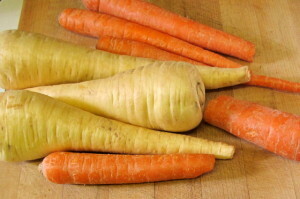 And while we think of root vegetables as winter vegetables, they start coming in while it's still hot... Thank you! Slow cookers are like magic in the kitchen. Perfect comfort food for the cold winter months. Absolutely... Once you cut the vegetables up, the work is done! I was just thinking this week how I need to make better use of my slow cooker. This recipe is a great place to start! I know the feeling - every time I use it, I wonder why I don't more often! But yes, I love this one. Enjoy it! I've never thought to slow cook my veggies - that'll save me space in the oven when I'm making a roast! Absolutely! And set it up, and you don't have to even think about it again for hours... Just what I need with a big dinner! What a great idea! Especially when trying to cook multiple dishes at once. Thanks! I like to set it up off out of the way somewhere... in a busy kitchen. We always get so many turnips, parsnips, rutabagas, and other root vegetables this time of year. I usually roast them, but next time I'll try cooking them in the crockpot instead! Oh, yes - the CSA gives us one of this and two of that, and we have a p9ile but not enough of any single one for a meal... But this way, I take care of them all at once, and then can use them in several meals. Enjoy it! We're so used to the idea that vegetables don't do well in a slow cooker, because so many don't. But the hearty root vegetables are wonderful cooked this way! Enjoy them! Do you think I could freeze this and pull them out as I need them? I love that I can make such a big batch.... but that would really help me.. Absolutely - I do that all the time. Makes the crazy season so much easier! Enjoy it! I often get sucked into thinking "root vegetables must be roasted", so I love that this frees up my oven! Plus, I'm one of those "you can't go wrong with more garlic!" people, so I love the whole cloves that you threw in there! Yum! This gives a somewhat similar eff3ect - not exactly the same, of course, but it still preserves the flavor better than boiling. And you can always add more garlic... LOL It's so sweet, cooked this way. I love repurposing big batches of dishes like this to make several "new" meals or sides out of them. Looks great! Oh, yes - especially with just the two of us, it gives me so many more options. Thank you! Root vegetables are so underrated! They're absolutely lovely cooked so many different ways. Love that you did them in the slow cooker! They're seen as these humble, boring vegetables - and they have so much flavor! (When it isn't all boiled away in huge pots of water...) I remember the shock of discovering how good a cooked carrot can be! And when you blend them like this, they just complement each other, and they're amazing. Thanks! I don't know why we don't eat more root vegetables. They are so good for us. I guess I never think of using the slow cooker for them. I've put the vegetables on my grocery list and I'm dragging out the slow cooker. This would be a great addition to dinner on a busy day! Absolutely. I use it with plain grilled meat, or anything like that. Thanks! Hello there, I have been gifted a large beautiful beet, would beets work with this as well? Beets work, and are delicious. Just one caution - they will turn everything around them red as well. If that doesn't bother you, go for it!